I’m a freelance writer living in the Washington DC Area, who has written about destinations, recreation and food culture since 2007. I serve as the Active at Large for the Eastern Chapter of Society of American Travel Writers (SATW). My work appears regularly in print and online publications—including The Washington Post Travel , AAA Traveler Worldwise FoodieTravelUSA.com and Getaways for Grownups. In addition to my journalistic pursuits, I am a photographer and my images have been in countless publications and seen online. I am a tour leader and presenter for Smithsonian Associates. I served as editor for “Oh Ranger” Guides published by the American Park Network. I’m a contributor to RootsRated.com the outdoor recreation site. I provide images and blog posts for Destination DC, the Washington DC visitors bureau. I work as an Inspector for ForbesTravelGuide.com researching and describing their four and five diamond hotels and restaurants. I am the Dining Editor for VivaTysons and VivaReston Magazines. Read my story about New Orleans 300th Anniversary here. I’ve also had features in Fodors.com For more links to my work, read on. My book 60 Hikes With 60 Miles of Washington DC co-written with Rachel Cooper is now available on Amazon. To read about some of the region’s best hikes check out Facebook and this blog post Read an interview featuring my book at Getaways for Grownups. My hiking book was featured in the Washington Post Express. I am in the processing of developing a thorough update for the Unofficial Guide to Washington DC. In previous editions, we offered practical advice on how to navigate DC’s best attractions, find affordable hotels, as well as choose convenient transportation in and around DC. You can order the guidebook now UG WASHDC book cover 2015 $12.99 on Amazon. It won “Best Travel Guidebook of 2016” from the Eastern Chapter of the Society of American Travel Writers (SATW). Travel features in The Washington Post In Silicon Valley, Dropping in at GooglePlex, Jobs House and Tech Museum and Bypassing Vacation Headaches with Travel Passes. Guest blog on RailEurope on benefits of Swiss Travel Pass. Cover stories on Weekend Getaways and Day Trips have appeared bi-annually in Northern Virginia Magazine since 2006. Look for my cover story on Weekend Getaways in the September 2009, 2010, 2011, 2012, 2014, 2015, 2016, 2017 and 2018 issues. Posts on RootsRated.com like Food, Brews and the Self-Guided Cultural Excursions in Shenandoah Valley. Articles advising readers on “Multi-generational Cruising,” most recently in The Boston Globe March 2015. Guest Spotlight on Windstar Cruises’ Blog. Curbed.com’s Hotels Week 2014 featured three of my insider recommendations on booking hotels. Contributor to ForbesTravel.com describing luxury hotels and restaurants (There’s no attribution when you’re a Forbes inspector). Contributor to Washingtonian‘s travel packages in the May, August and October 2014, 2015, 2016, March 2017 and August and October 2017. My features have appeared in a wide variety of publications and websites including DC Examiner, Adventure Biking, Running Times, Park & Recreation Magazine, Maryland Life.I also published a chapter in Chicken Soup for the Soul Stay at Home Moms and a monthly column in Northern Virginia Magazine called “Kin” from September 2006 until August 2012 which delved into challenges faced by parents including mental health issues, adoption, divorce and nutrition. As a photography enthusiast, my photos have appeared in Boston Globe, USAToday, Pittsburgh Post Gazette, The Washington Post, VivaTysons, AOL Travel and Northern Virginia Magazine. 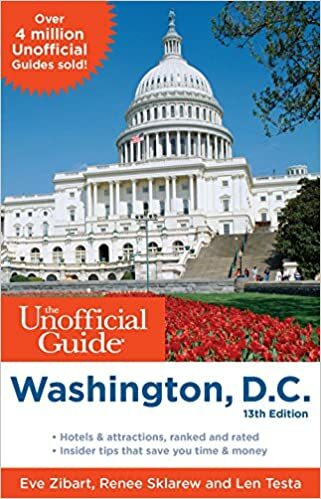 The Unofficial Guide of Washington DC was awarded “Best Travel Guidebook of 2016” at the Eastern Conference of the Society of American Travel Writers (SATW) judged by the University of North Carolina School of Journalism. In 2008, the Virginia Press Award for Lifestyle Writing recognized my September 2008 cover story (co-written with Kathryn McKay) on traveling the region: “High Tech to Low Country.” “Why I Love My Hometown” was a winner in The Washington Post’s essay challenge. I graduated from Indiana University in English and Journalism, and worked in television at Entertainment Tonight (New York Bureau), then in radio in St Louis’s KMOX. I moved onto communications and development for nonprofit health organizations, including the Lombardi Cancer Center at Georgetown University, Muscular Dystrophy Association and the Maryland Chapter of the Alzheimer’s Association. I served as Executive Director of the Combined Health Appeal of the National Capital Area. I attended Catholic University’s graduate program for a Masters in Social Work. I grew up in Potomac, Maryland where I developed my deep love for the city of Washington DC. During my childhood, my family lived in Zurich, Switzerland and London, England as well. My passion for travel developed early, as my family and I explored new places. As an adult I lived in New York, St. Louis and Colorado Springs. When I visit a place, I love walking the streets, sampling native delicacies, and meeting locals. For the last several years, my extended family has gone on holiday together, and consequently, I’ve learned a lot about what works for multigenerational travel. It is SO cool! You have a blog! I LOVE THIS! You are smart, nice and creative! p.s. For those who are reading this website, I am Renee’s daughter who had a heart transplant! Congratulations on your website! It looks great! Congratulations on your website! It looks great! I love your articles. Renee: Such an impressive website! Good for you! I’m happy to have found your blog, Renee. I’ve already read some of your posts and I look forward to exploring more of your nice blog.